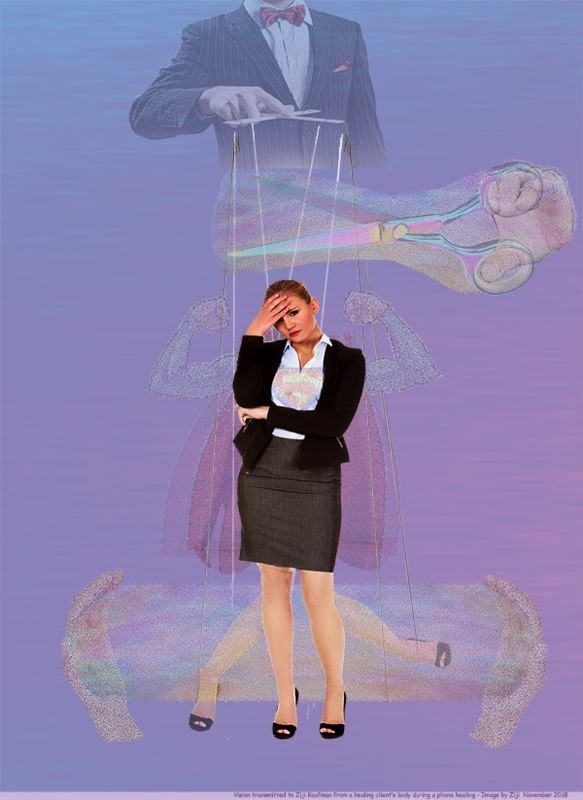 This image I created represents a vision I received during a phone healing with a client who was feeling trapped in a very controlling father-daughter relationship. She was under his manipulations both as a financially dependent daughter as well as an employee of his hugely successful nationwide business. At the beginning of the healing, my client’s body wisdom showed me one major area of her aura that had serious distortions: her auric legs from the knees down. It was a pretty disturbing vision seeing her lower auric legs completely bent out of alignment. Intuitively, I suspected that these auric leg distortions were caused by her difficult relationship with her father. An interesting and also hopeful aspect of this vision, was that every other area of my client’s auric body was in proportion and looked healthy! In particular, my client’s thighs seemed to be carrying almost super human powers; to emphasize this, her body wisdom showed me a vision of my client as a pop-culture female superhero! When I telepathically tuned in to her powerful thighs at a deeper level, I got a flood of visions, most likely from past lives, of my client as a completely powerful and competent leader. Most notably, I saw her in a recent past lifetime where she was a businesswoman, similar to Meryl Streep’s character in the movie “The Devil Wears Prada’, although my client was not mean to her subordinates as Streep’s character was in this movie. 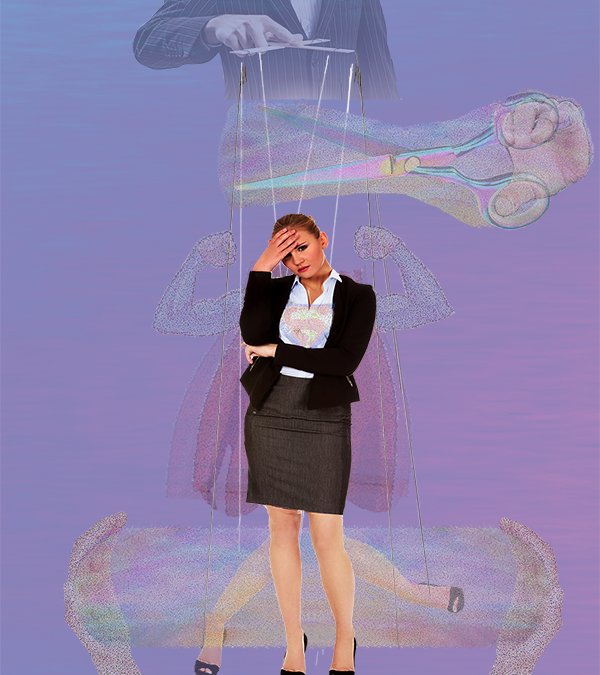 Unfortunately, in this current lifetime, my client’s superhero leg power has been cut off at her knees energetically, due to her father’s puppet-string-pulling control over her financial, professional, and emotional life. Thus my client has not been able to ‘find her legs’ or ‘get her footing’ in this current lifetime, and thus has not been able to rediscover and reclaim her past life powers of leadership, competency and self-confidence. Seeing these suppressed, unrealized gifts locked-up in my client’s aura made me sad, as I imagined how much good she could do for the planet if these leadership powers could be unearthed and resurrected. At this point in the healing, I was guided by her body wisdom to work on two separate fronts: (1) to try to correct the distortions in her lower auric legs, and (2) to see if there were toxic energy cords from her father (in effect, ‘puppet strings’), that could safely be cut, so that my client could find her inner strength to free herself from her father’s overbearing control over her life. To straighten out her lower auric legs, I was guided to place my auric hands on the outsides of each auric leg. This created a strong energy field within which my client’s twisted-up legs could untwist themselves. This untwisting process was wild to behold, looking like clothes being whipped around in a washing machine. I can’t say that her lower auric legs were perfectly straight and in proportion at the end of the healing, but it was over 90% aligned, as I recall . to cut all the energy cords that were attached to her lower auric legs. Cutting these cords, allowed my client to finally feel what it was like to “step into her power”, “put her foot down”, and “hit the ground running”. The cords that I did NOT get permission to cut were the ‘heart strings’ connecting father and daughter. Yes, most of these heart strings were also toxic and would need to be cut eventually, but apparently my client wasn’t ready to risk losing touch with her father’s heart. Her body wisdom clearly indicated to me that these cords were too deeply rooted and emotionally-charged to be disconnected, at least for this particular healing session. By the end of this healing, I felt good about my client’s chances of eventually breaking away from her father’s manipulative grip on her life, and of reawakening her ancient superhuman powers of leadership, among other great ‘powers’ she once possessed. Awesome and so powerful to read! I really enjoy the session we have together! Great work ZiJi from the Realm of Truth!